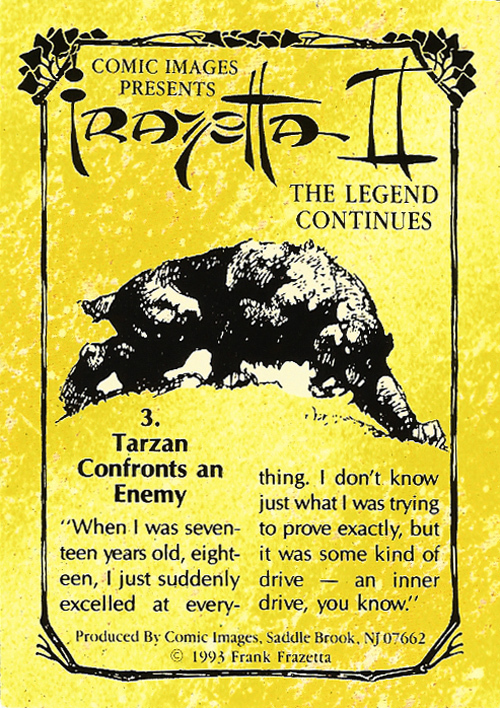 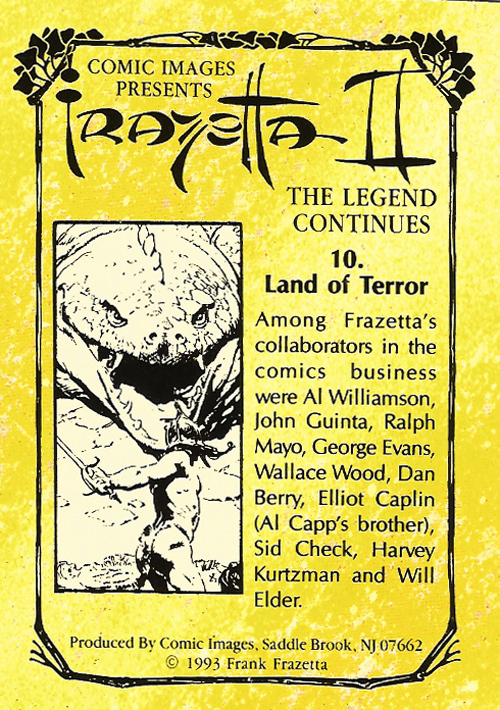 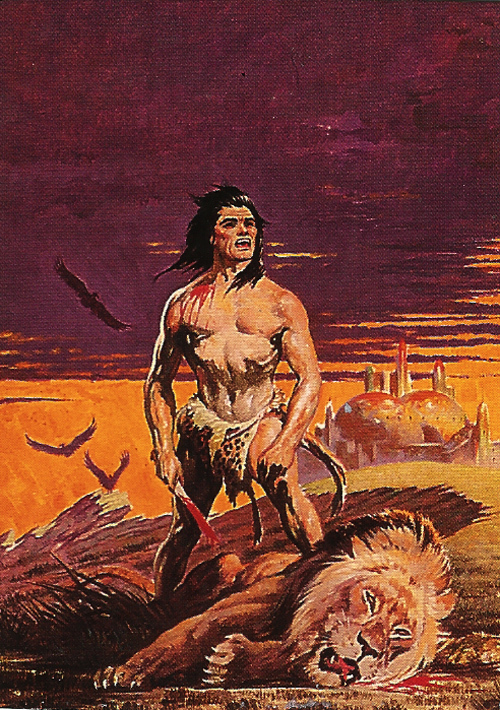 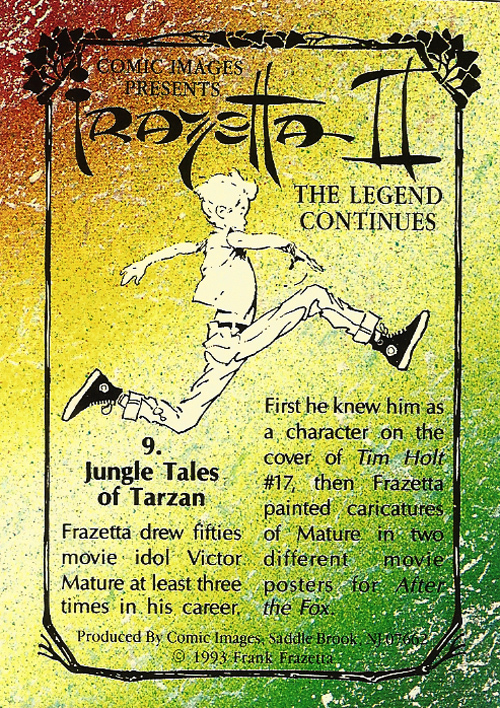 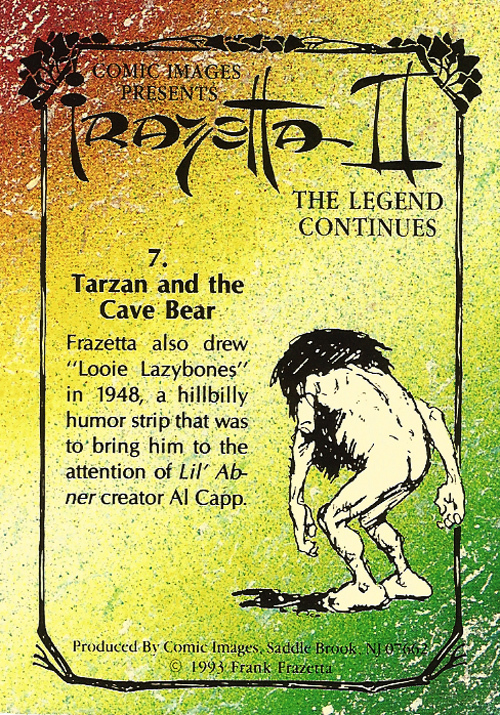 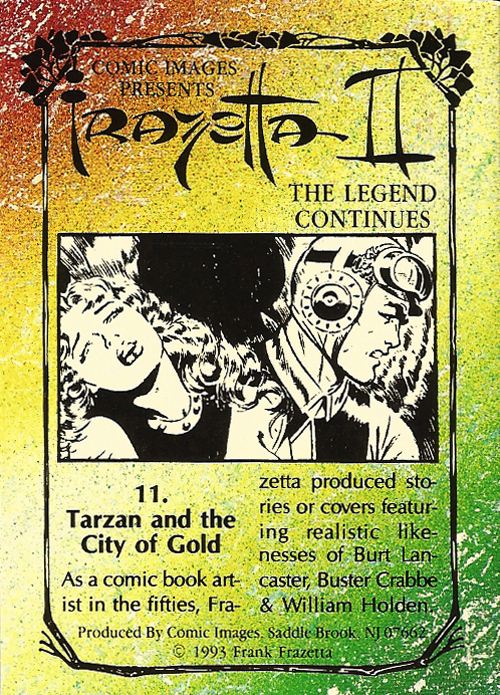 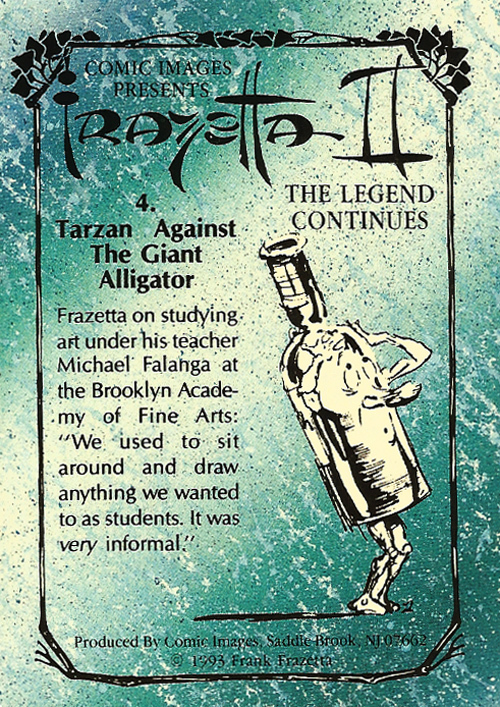 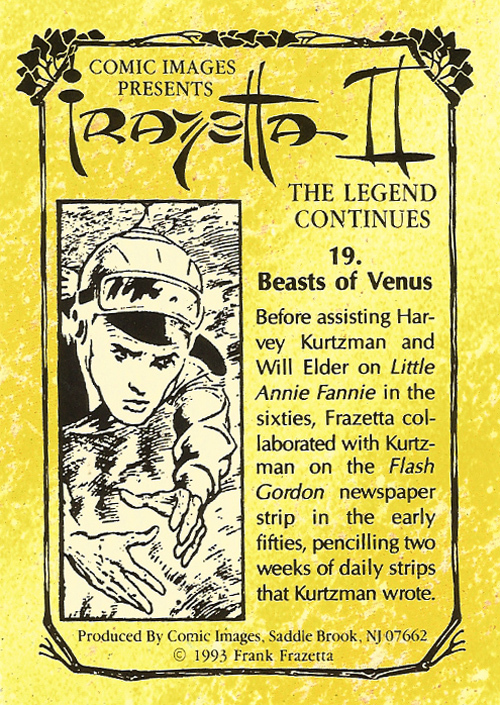 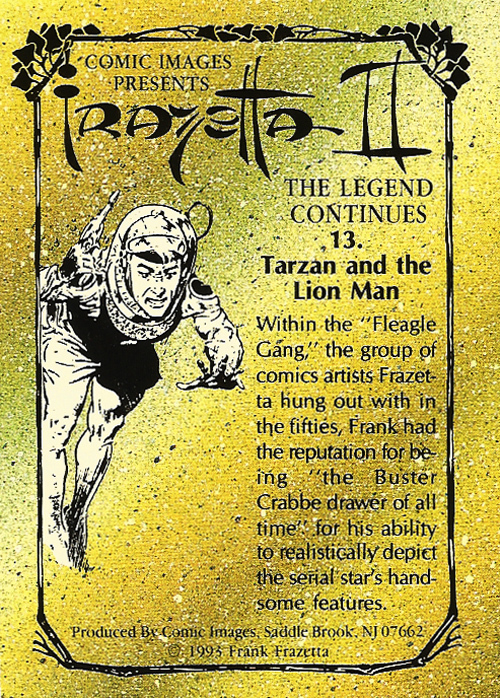 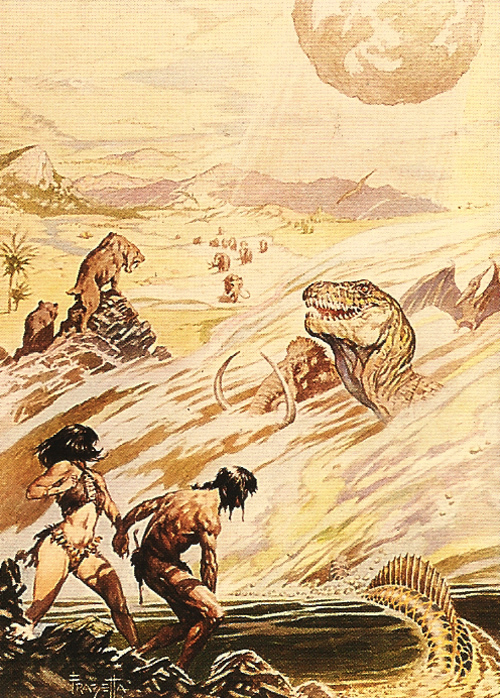 Frazetta II: The Legend Continues Trading Cards #1-20 (1993) | 'TAIN'T THE MEAT… IT'S THE HUMANITY! 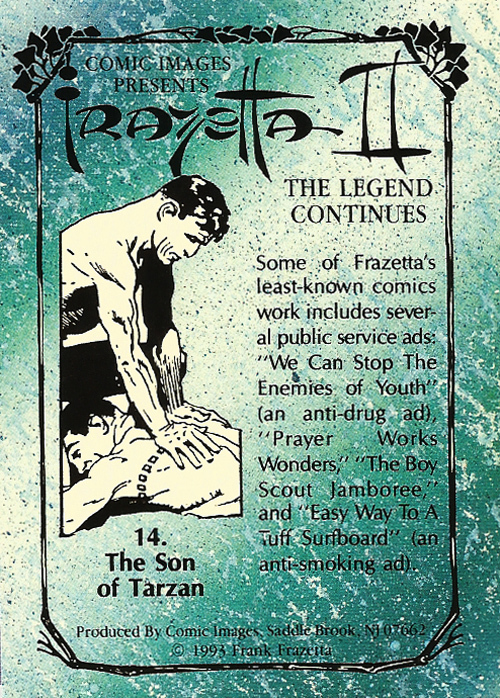 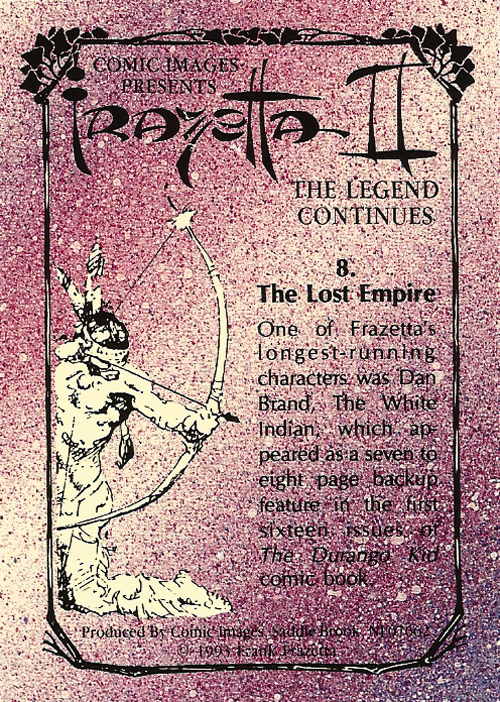 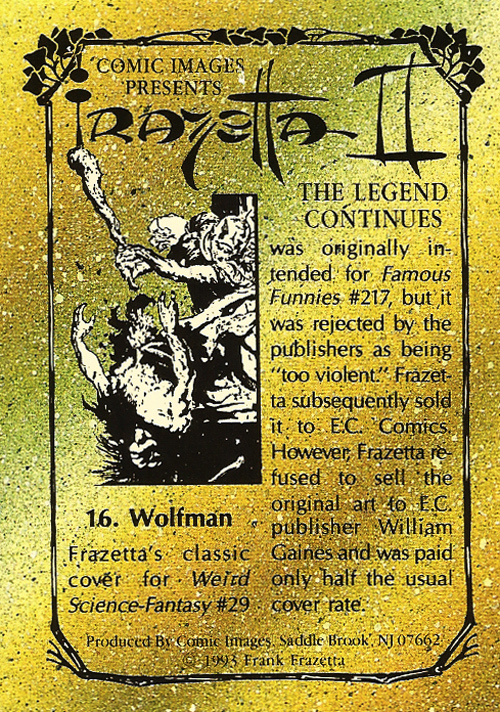 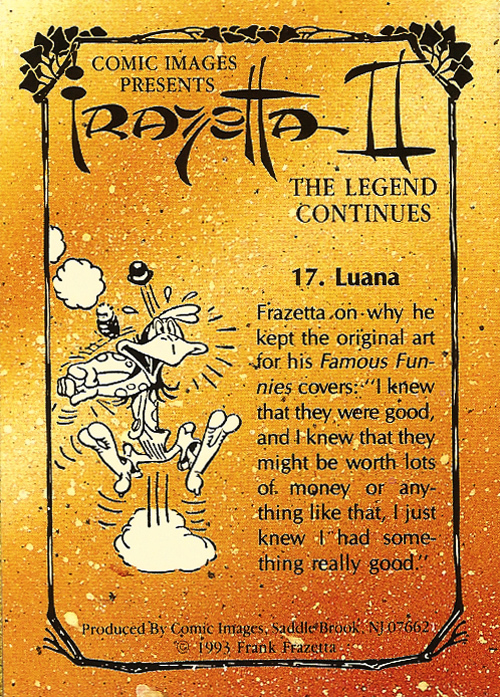 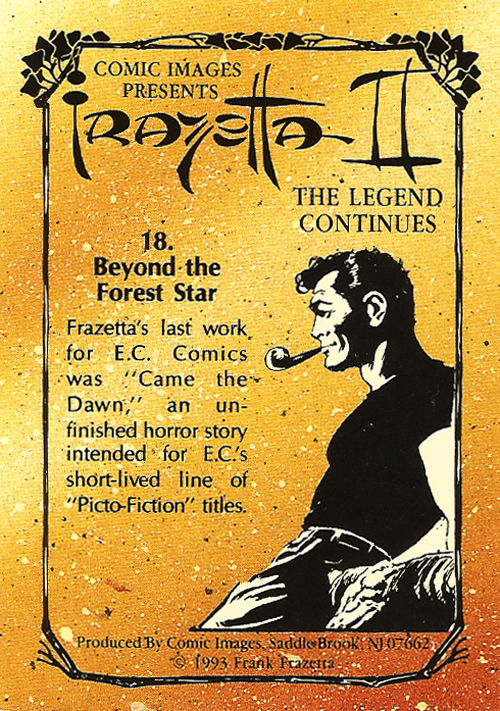 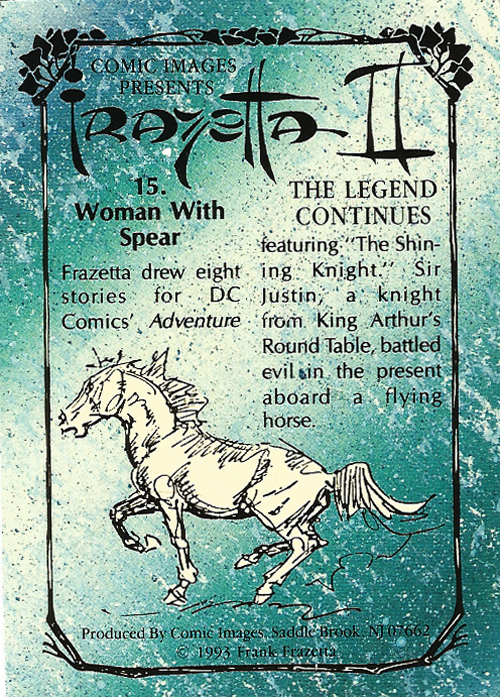 Frazetta II: The Legend Continues was a trading card collection published in 1993 that celebrated the work of one of the fantasy genre’s most popular artists — Frank Frazetta. 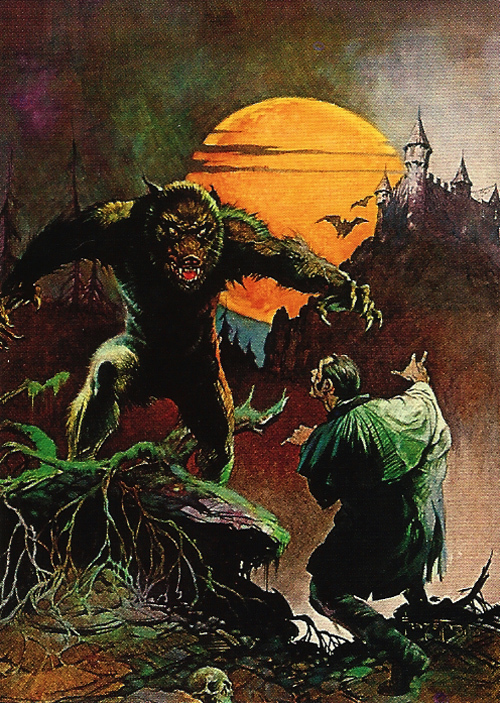 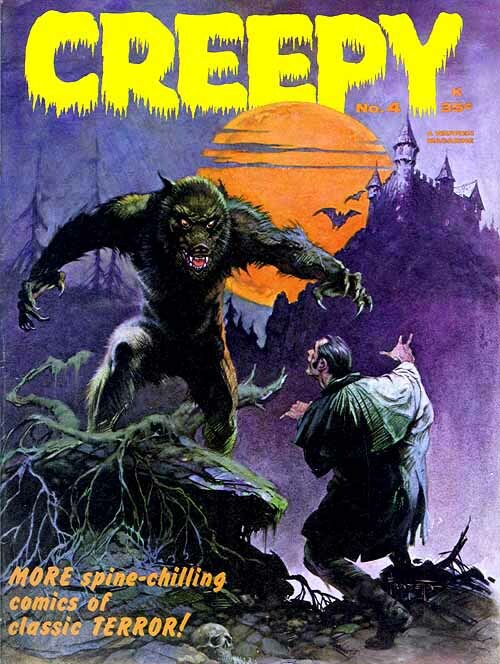 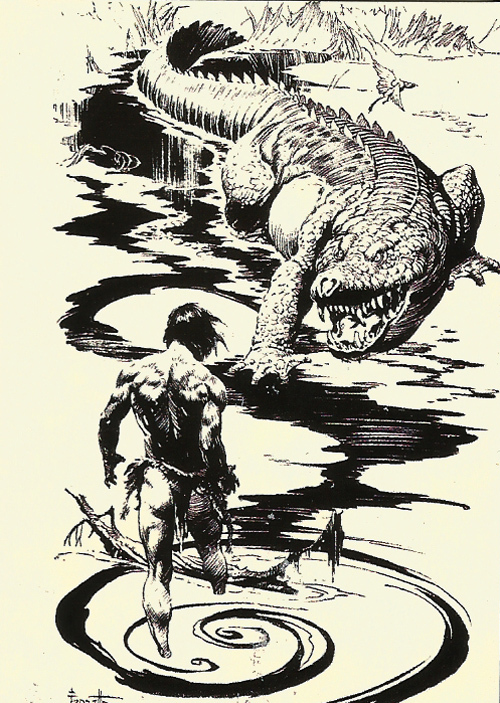 Published by Comic Images this set was the follow-up to a collection released two years earlier simply entitled Frazetta. 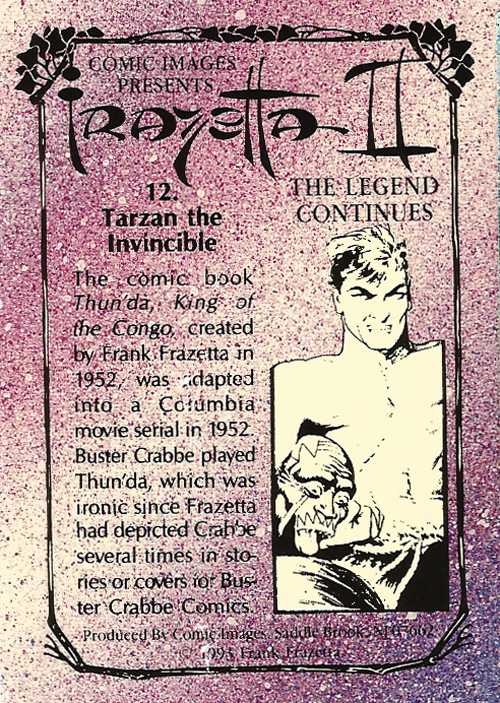 Like its predecessor this set featured 90 trading cards measuring 2.5 x 3.5 inches that shipped in blind packs of ten. 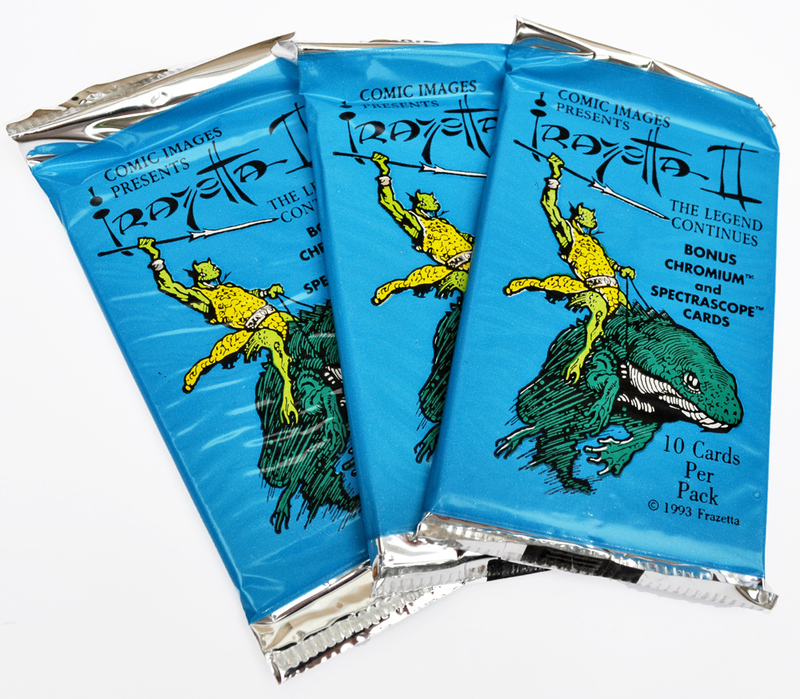 Also included in the collection were three chromium and three spectrascope chase cards. 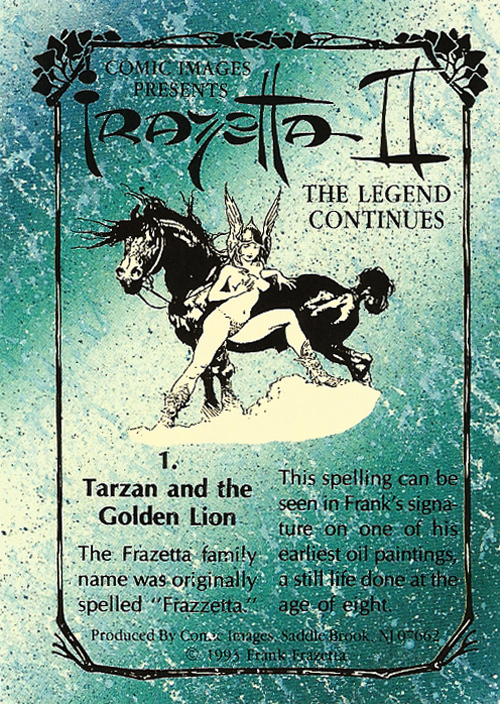 Each card depicted a painting or drawing by Frazetta on one side, with a short caption and pencil sketch on the reverse. 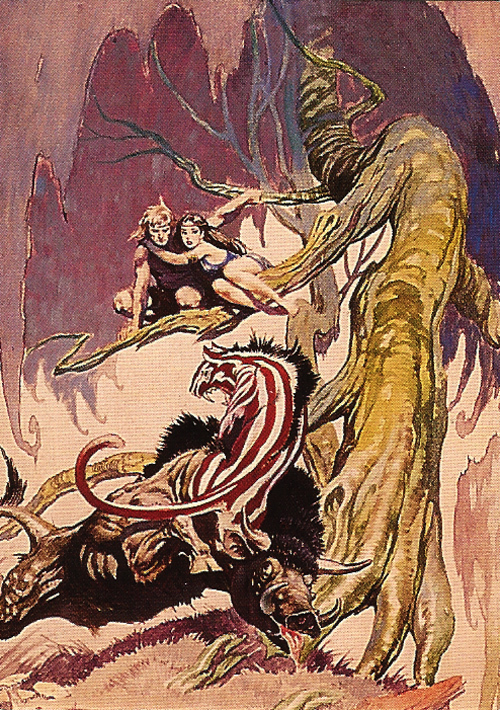 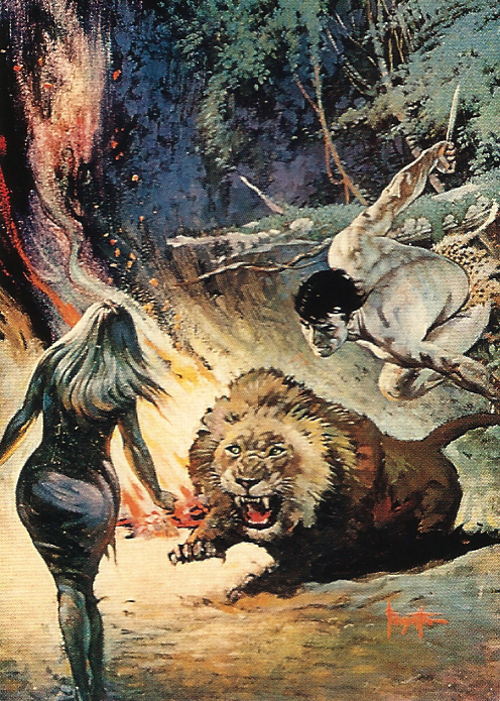 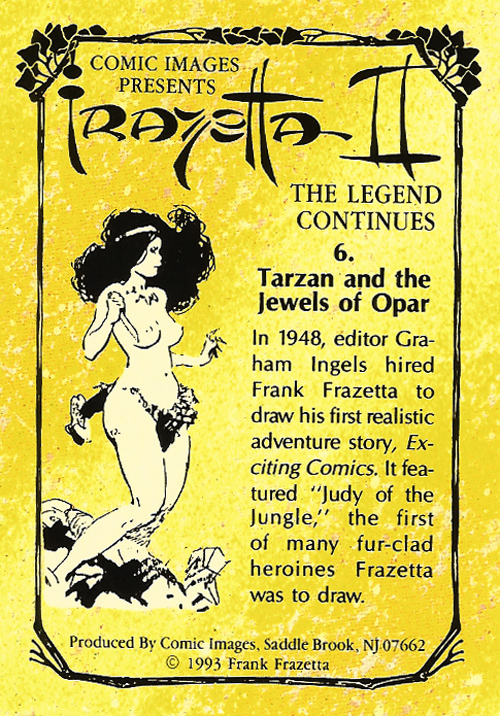 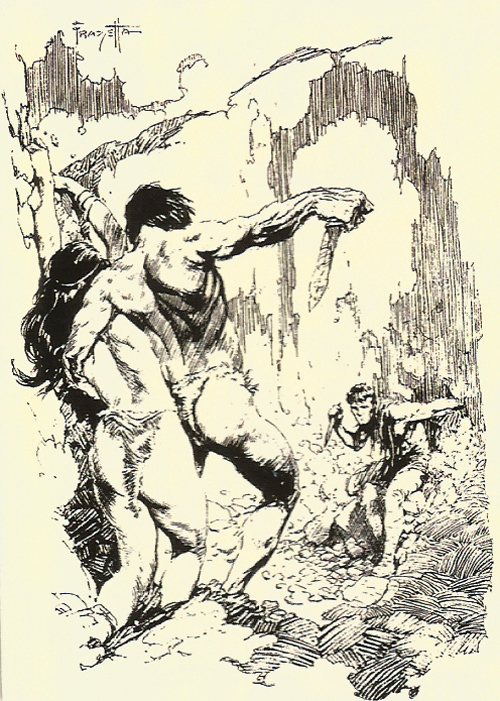 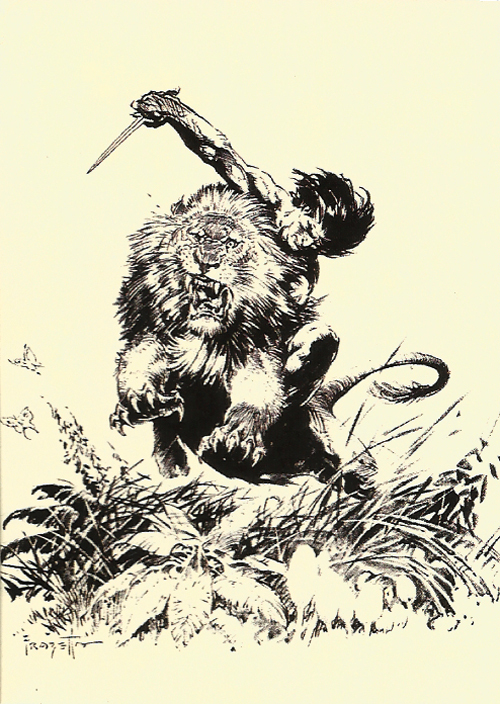 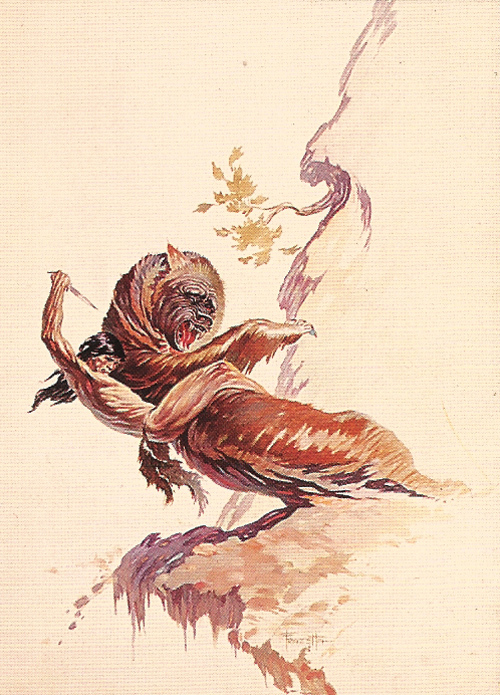 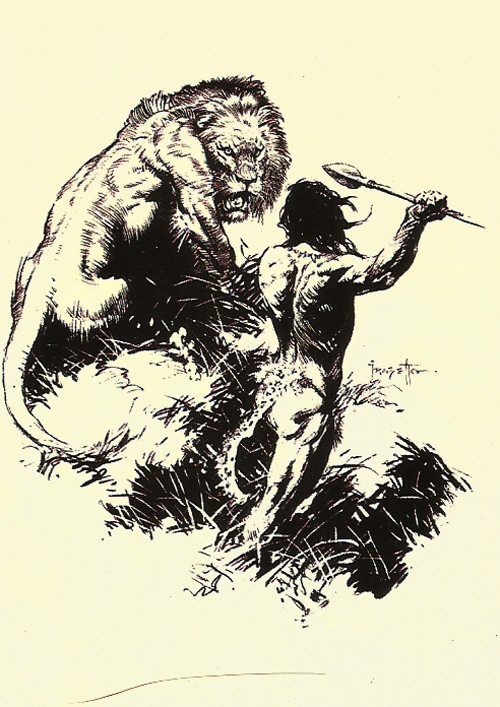 The images in this first batch of cards featured artwork from Frazetta’s Tarzan work, some pen and ink sketches as well as covers for Creepy (cards #16 and #20). 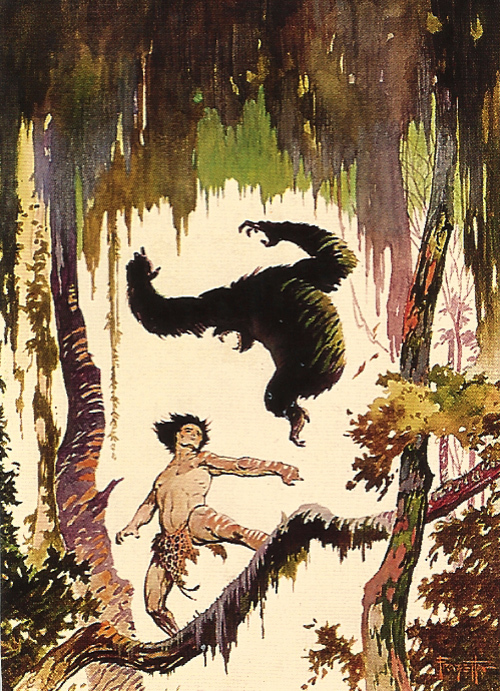 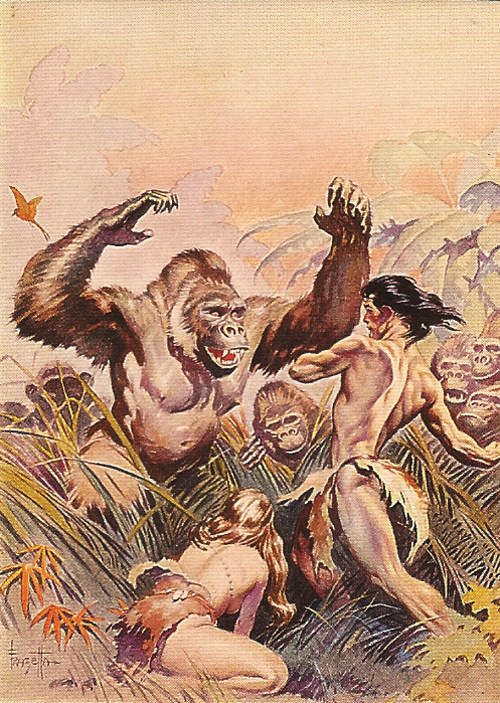 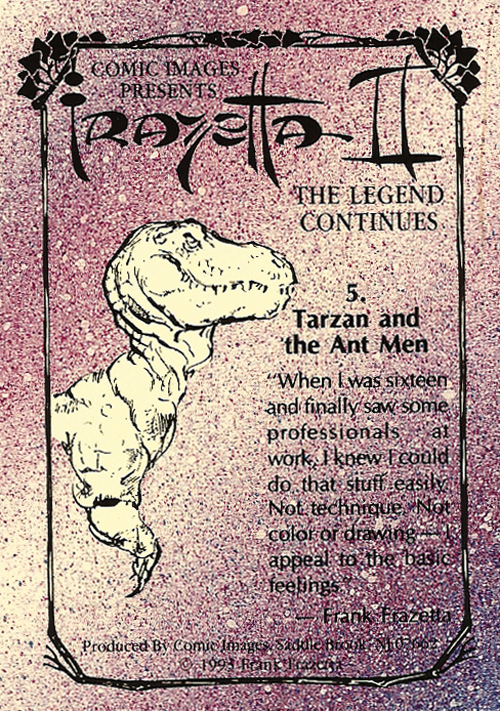 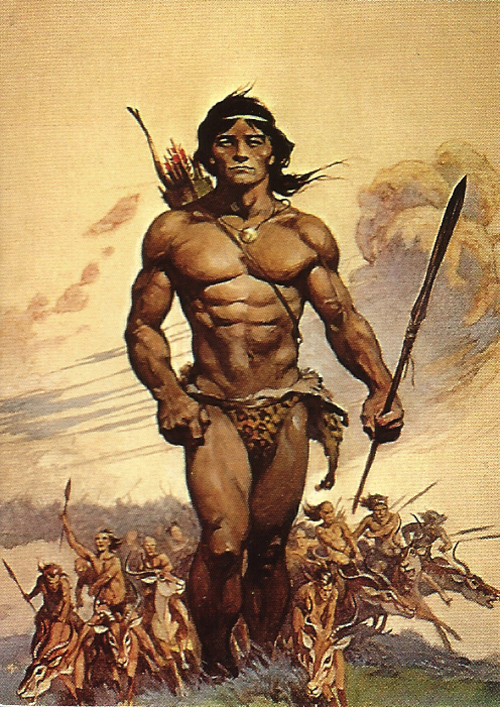 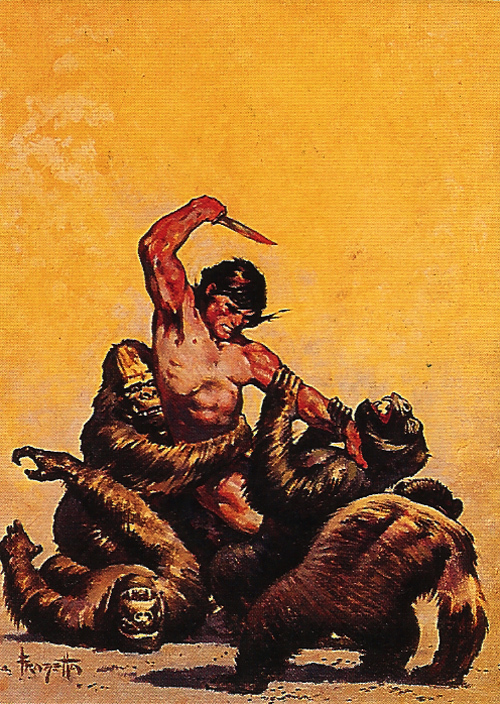 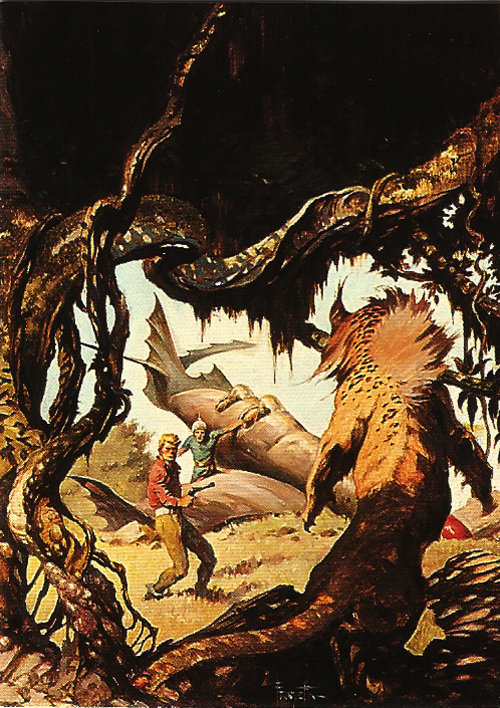 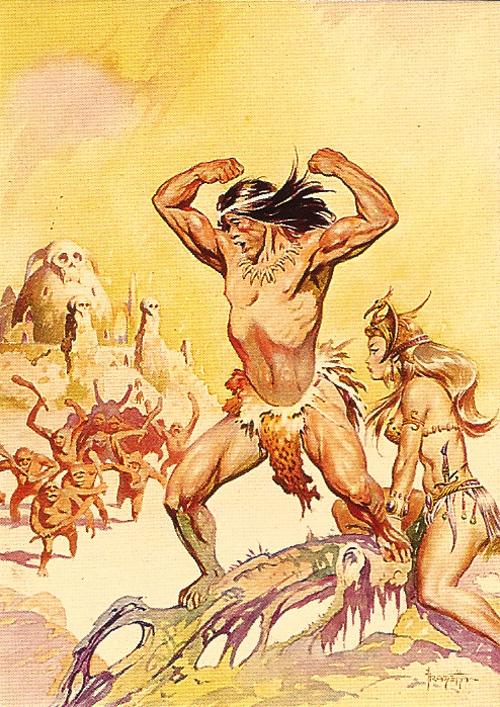 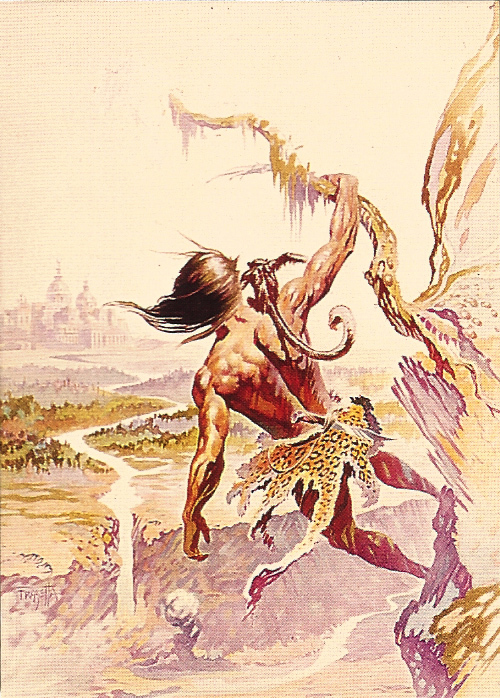 There’s some nice stuff here: Tarzan and the Ant Men (#5) featured a bold and resolute Tarzan, while Beyond the Forest Star (#18) showed Frazetta in top sci-fi form. 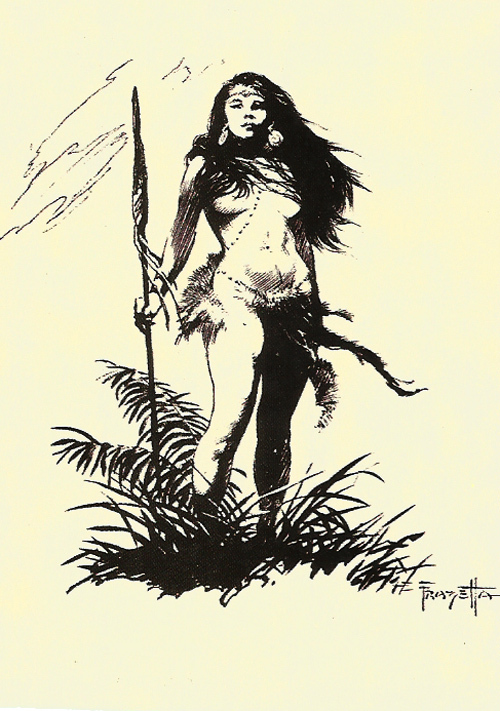 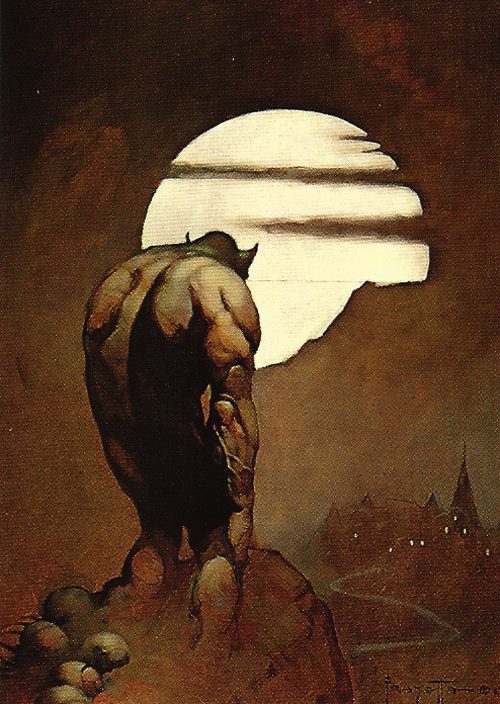 And then there’s the terrific Luana (#17), one of Frazetta’s most iconic paintings.